The purpose of this article is to help the user set up Trezor Password Manager. This page applies to Trezor Model T (show for Trezor One). Visit Trezor Password Manager for more information about the product. 1.2.1 How do Trezor and Dropbox work together? 1.4 Enable Password Manager on your Trezor device. Trezor Password Manager works with Chrome and cross-platform on your MacOS, Windows, and Linux. To set it up, follow the steps below. Add the Trezor Password Manager Chrome extension into your browser. Then click on the Trezor icon in the top right corner of your browser. Click on Sign in with Dropbox or on Sign in with Drive and log in with your account. If you do not have a Google or Dropbox account yet, you can create one for free. If logging in with Dropbox, give your Trezor permission to create a folder in your Dropbox to store all the passwords and confirm. Do not worry, the passwords in your Dropbox will be encrypted and inaccessible without your Trezor. How do Trezor and Dropbox work together? It's quite simple. Trezor Password Manager creates a folder “/Apps/Trezor Password Manager/” in your Dropbox and stores each password entry in a separate encrypted file. All files are encrypted using keys derived from your Trezor. It is not possible for anyone else to access your passwords nor to make any edits. To learn more about entering your PIN, see User manual:Entering your PIN. Enable Password Manager on your Trezor device. This action will start the encryption of your password files with your Trezor. Congratulations! You are ready to use Trezor Password Manager. Tags are used to filter and find your passwords easily. You can add and remove tags according to your needs. The overview of your tags is in the left pane. You can edit the name and the icon of the tag. Click on Add tag button on the bottom of the list of your tags. Switch between the list of available icons by using little blue arrows. When done, click on Save. If you wish to edit an existing tag, click on its name and edit or remove the tag by navigating through the three dots on the right. To add a new password please click on "Add entry". URL: Enter the login URL of the service. Password: Note that you can generate a new secure password. Tags: Select from tag list below the field. Secret note: Does not appear in the passwords preview and can be used for example to store your 2FA tokens. Select "Add Entry" and fill in the URL and Title. Consider adding a tag "bookmarks" for faster search. Open to log in: Click on the entry name and a new tab with pre-filled user credentials will open. You will be asked to confirm this action on your Trezor first. Copy password: One click to copy the username into the clipboard. You will be asked to confirm the action on your Trezor device. Edit entry: To edit an entry, click on Edit. You will need to confirm the action on your Trezor device. 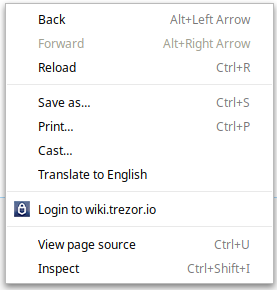 You can use some of the keyboard shortcuts below to make it easier to work with Trezor Password Manager. Shift + Alt + U restarts the Trezor Password Manager extension. Shift + Alt + F enters the username and password in the login form of a website (that you have stored previously with Trezor Password Manager). You will be asked to confirm this action on your Trezor. It is also possible to fill in the username and password by right clicking on a website where you want to log in and choosing the "Log in to" option. Remember to have your Trezor connected. Otherwise, it will not work. The little green square in the corner of the Password Manager extension icon indicates that your device is connected and that your credentials are stored for the currently open website. At the top right, click on Customize and control Google Chrome. Go to More tools >> Extensions. Find Trezor Password Manager and click on the toggle button to enable or disable the extension. Warning The exported CSV file is in plain text and it is not encrypted, please be careful with your passwords when using this feature. Starting with Password Manager version 0.6.3, users can export or import the passwords to or from third-party password manager services. To export or import passwords, click on the account in the right top corner in the Password Manager and choose import or export. When importing your passwords from third-party services, it is possible to sort your CSV columns by type. This page was last edited on 6 February 2019, at 11:40.